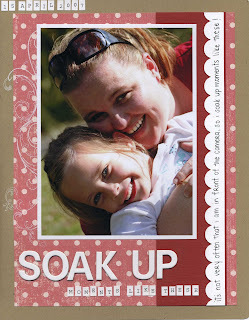 I saw this on Wendy Sue's blog and thought it was a great idea...an easy way to update my blog too! 1. Mother's Day was just wonderful. This year with both the girls being in school and kinda I received gifts just from them. Caitlin bought me a little wire basket filled with a manicure set, body wash, a loofah and a makeup purse that she purchased from the Mother's Day stall at school. From Georgia I got a frame that has her hand prints in them as well as a handmade card. We had lunch with my in-laws at Moonee Valley, which was yummo and then spent the afternoon lounging around at home. My mum and dad came here for tea and we got pizza and pasta from my BIL's pizza shop. 2. Miss Gigi has had her first real haircut and she looks like such a little girl now. How could you not love that face. 3. Saturday I headed over to Picture to Page with Jen Hen and Karen and met Miss Wendy there. The show was ok but a lot of old stuff. I did manage to spend a bit of money though, funny that, but not as much as i thought i would. Jen, Kaz, Wend and I then headed over to Sofia's for lunch and let me just say that I have never seen a meal so big in all my life. It was just so nice to sit with the girls and chat, I really enjoyed it. 5. We now have two working toilets in our house LOL. My dad came around on Saturday night and connected all the plumbing and then on Sunday Alan plastered the walls and Andrew wired up the light, so our second toilet off the laundry is now officially a toilet and no longer a storage room for renovation stuff. 6. Friday night Karen, Linda and Evelyn (my other Mum) came over for a little scrap session. I only managed to get two layouts and a card done, but that is good for me. I will scan and upload some LO's a little later. 7. 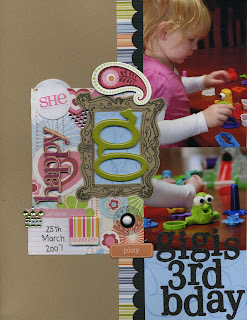 Also on scrapping, I went to Sensational Saturday at Scraptacular with Miss Wendy Saturday week ago. We scrapped from 10am to 9.30pm and I completed 5 layouts. I had such an amazing day and it was lovely to met so many wonderful new people. I am so looking forward to next month. I also got to catch up with Rachael and her beautiful little girl Bella who, let me tell you is the sweetest little thing ever, and such a good girl. 8. 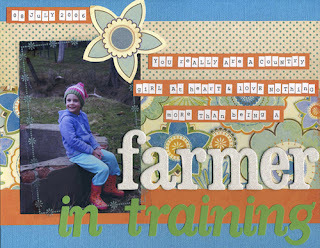 This term at school for Caitlin is all about the farm. Yesterday all the prep's went on their first school excursion the the Bundoora Children's Farm and last Friday they had a farm parade at school. 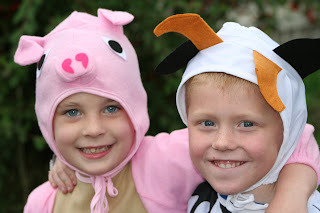 Caitlin went dressed as an adorable pink pig and I got the cutest pics of her and Jordan, who went dressed as a bull. 9. Andrew has decided that YES redoing my scrap room is a great idea and between the two of us we have come up with a plan that we both like. He is going to build me a massive desk that will run from one wall all the way to the other which will give me a big space fro scrapping, a space for the laptop and printer and also a space so that i can keep my sewing machine out too. We are also going to get two 16 cube bookcases and I already have a tall bookcase that is still raw, so I can paint that to match. I really wanted to go for white but am now heading towards chocolate brown for all the furniture. Anyway it something to think about and I have plenty of time to do that as it won't be happening until the other renovations are done. 10. It has taken me longer than I thought it would to reach number ten and I can't think of anything else to tell you LOL. Ok how about i need to do some house work? That'll do. Thanks for dropping by. Hope everyone is having a good week so far. It has been ages since I shared any LO's, mainly because it has been ages since I scrapped anything just for me. This LO (Schoolgirl) was quick and simple. 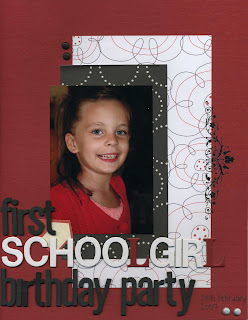 Caitlin has been to heaps of parties before, but this was her first one since starting school. Another quick and simple one (Mwah). I have been wanting to scrap this photo of Andrew and Caitlin for ages. I'm not completely happy with this LO so I might have to play around with it for a little bit longer. It just needs something else...what exactly I don't know yet, but I'll get there LOL. This LO (Soak Up) has on it my fav photo at the moment. As the journaling says, it's not very often that I am in front of the camera and Andrew seems to doing well with his 'how to use Ange's camera' lessons. And lastly this LO (3rd Birthday) is proof that I am a good mother, as Georgia made it to her 3rd birthday LOL! Why is it that she looks so angelic in photos??? Well that's it for me today. Off to finish the housework and figure out what's for tea tonight. Hope every one's having a good day. Ok, so I didn't make it back yesterday for my promised update, but I'm here now LOL! * Miss Gigi and I are still persevering with 3yo Kinda and 1 day of occasional care. She has fine tuned her ability to make me feel like the worse mother in the world and I ma sure she has convinced herself that she is not allowed to have fun while she is there. It is getting better though and hopefully within a few weeks it will all be good. * Renovations are back in full swing here, albeit it slowly. Andrew is in the laundry as I type, removing the hideous old wallpaper from one wall and also from the walls in the second toilet (which is off the laundry). My dad is dropping in one night this week to connect the plumbing for the toilet and then our resident plasterer, Alan, will be coming on Saturday to begin the mammoth task of re plastering in the laundry & toilet, the kitchen & meals area, the lounge room and then finally the rumpus room. * Caitlin lost her third tooth last night, one of the top front ones, and let me just say how adorably funny she looks with her new toothy grin. Thankfully school photos were taken at the end of first term. So anyways, last night we placed the tooth in this special little silver bag (like the ones you get jewellery in) and hung it out for the tooth fairy. 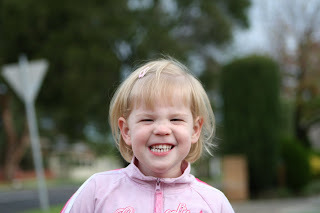 She was busting at the seems this morning to see if her tooth had been taken and was absolutely delighted to find a $5 note. She also told us that she could see a little bit of fairy dust in the bottom of the bag (plaster dust, but who am I to burst her bubble)LOL. * Not alot of scrapping has been done lately, but I think my mojo is returning. I discovered the 123 Challenge blog while I was blog hopping one day and decided to complete the April Challenge, which was to use a chipboard swirl, use some bling and not to use any paint anywhere. The LO turned out very simple, but I loved it, and I am pleased to say that I won one of the prizes for my efforts WOOHOO! So here is the layout and don't forget to check out the 123 Challenge Blog and have a look see for yourself. * Friday night just gone I had a great night here at home with some great company. I asked my Mum to come over and scrap (she's just discovered the obsession) and just chill out and then I spoke to Miss Wendy, and when I mentioned what I was doing she said she might head over for a coffee if she got the chance. Wend did get the chance and arrived just after six bringing with her the yummiest Chicken Curry, Kumpow Chicken and rice. Kass called to ask if she could pinch a pizza box from me to send a LO off that had been accepted for SC, and so she arrived at about 8pm, with my Mum arriving soon after. 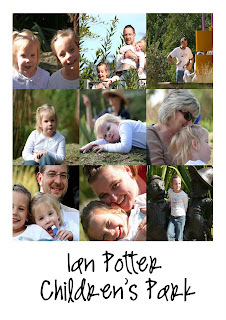 Needless to say no scrapbooking was done, but we certainly did get a heap of chatting done LOL. It was a great impromptu girls night and couldn't have been better if I planned it. 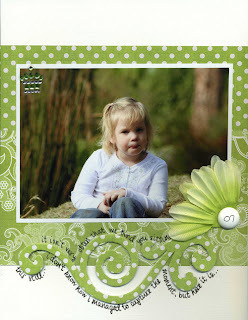 * I have discovered Stampin Up! I know that most of you have probably already made this wonderful discovery and you are all in trouble for not passing it on to me LOL. That's all I can think of for the moment. I have a busy couple of weeks coming up so I will have more news soon. Hope everyone is having a nice, relaxing Sunday. I'm off to try and do some scrapbooking, just have to clean my scraproom first ARGH! We visited the Children's Park in the City on the last day of school holidays and I have been meaning to sahre some photos with you for over two weeks...better late than never! I am spending the day on my laptop and one of my 'things to do' is give my poor neglected a blog some much needed attention, so I will be back a little later with an update on what has been happening over the past few weeks and I also think it was a bout time I shred some LO's, so I will add that to my list of things to do aswell. I am supposed to tag 7 people now but I am pretty sure that everyone I know has been tagged, if you haven't then consider your self tagged.